Too many times I’ve heard the same words: “I don’t really think about my finances and I think everything will work out in the end.” I’ve heard this with college education funding. I’ve heard this with student loan debt. I’ve heard this with saving for retirement. Guess what? 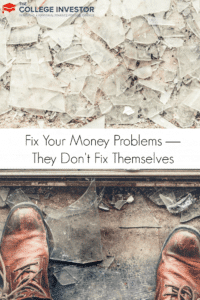 Your money problems won’t fix themselves. Everything will not just work out. You have to take action. You have to do something! The first thing you have to do to start tackling your money problems is get clarity on what the problem is. This is the #1 disconnect I see with people who think their money problems will fix themselves. They don’t know how much debt they have. They don’t know what their income and expenses are. They don’t know what the cost of school really is. Instead of simply being a delusional college student, get educated on your own financial situation. This can be as simple as setting up free online money management software and looking at the balances of all your accounts. Maybe it’s as simple as writing down your financial goals. It’s not hard, but you need to get clarity on your financial situation. Get clarity — but don’t stop there. The next step is setting up a plan. Once you have clarity, you can at least start to make accurate decisions when it comes to your finances. This is where having a good plan comes into play. It doesn’t need to be incredibly strict, but you need to look at your financial goals and look at ways to make progress toward them. It could start with setting aside a certain amount each paycheck to pay down debt or save toward retirement. Simple and easy. It could be to shop around for a better loan rate and refinance. No matter what your goals are, or what your situation is, you need to make a plan based on accurate financial numbers. Clarity and a plan — that’s the start. But fixing your money problems doesn’t end with a plan. You actually need to work the plan as well! I’m a fan of Personal Capital to track finances — but I would venture that 90% of them do nothing with that data. I bet 5% of the remaining people have even put together a budget or other financial plan, but once again, have done nothing to make sure that it is executed. That’s why, to solve your money problems, you have to not only make a financial plan based on solid data, but you have to work the plan as well. One thing that frustrates me about financial shows like Suze Orman is that there are so few follow-ups and check-ins. I would love to see more stories about people who went on the show, took Suze’s advice, and then solved their money problems. To go on the show, they have to get clarity on their finances. Then, Suze Orman gives them a plan. I would venture that very few actually implement the plan . . . so sad. That’s why for my Investing 101 course, I charge a fee. You can find everything I cover in my Investing 101 course online, even on my website. But by paying a fee, I know that you’ll take action and actually get started investing. Statistics show that people who pay for a course are five times more likely to complete a course than those who get the same course for free. If you want to take action when it comes to your finances, you need to make the plan and work the plan. What are your thoughts on getting clarity, making a plan, and working the plan? I agree with you that making things clearer for you to understand and making a plan on how you will tackle it and doing what you planned for are three important things a person must do to fix his money problems. There are very few things that work out by themselves! I keep my goals simple and reduce them to daily tasks. It is part of my plan to hold myself accountable and I can easily measure my progress. I am still surprised that some thing that the money issues will work themselves out. I did that a while back, but then realized that I was kidding myself. You have to buckle down and get it fixed on your own. It’s easy to get inspired briefly and try to make some quick changes. But the ones who are ultimately successful are the ones who can stick with over the long haul. The fact that you have to actually work the plan is a good point. This isn’t a problem I have with my finances, but it does affect me in other areas. I am a planner, so I’m good with money plans. I love to follow through and see my money grow and assess how the plan worked out after. I am a nerd like that. There are too many people waiting for money problems to fix themselves and nothing good can come from it. All I can say is. Yes. So much Yes. I just got off the phone with my sister who just got out of a money situation and is right back in it because she didn’t stay with her plan…UGH! The problem with most people is, they make a plan but they do not stick with it. I couldn’t agree more with you, Charles. People should be spend their money wisely because otherwise they’re gonna regret it in the end.